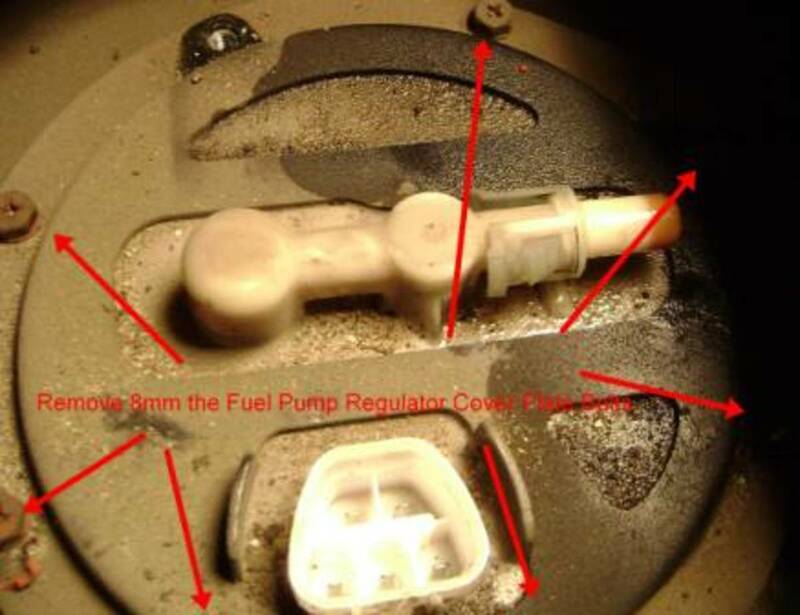 An old (10 years or more), high mileage (100,000 miles or more) Toyota may encounter a fuel pump failure with or without warning. When it fails, there is no nursing the car back home or to your garage. It must be towed. In the absence of performing a fuel pump pressure test, a failing fuel pump may be mis-diagnosed as a car that needs a tune up (e.g. spark plugs, air filter, fuel filter, ignition wire, etc.). Low speed idle may be rough, the engine may buck under acceleration or will start temporarily and stall. 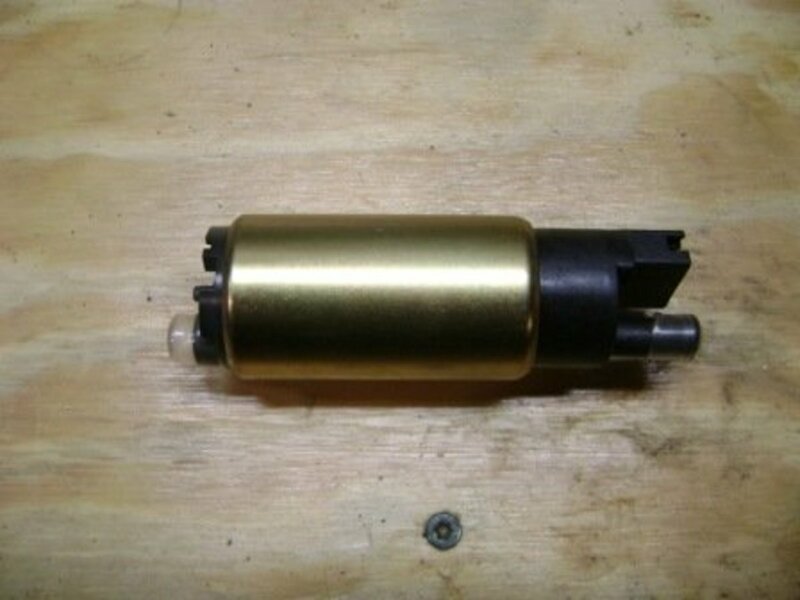 A constant high voltage sent from the PCM (Powertrain Control Module) to the pump to overcome back pressure in a clogged fuel filter will cause the pump to burn out. 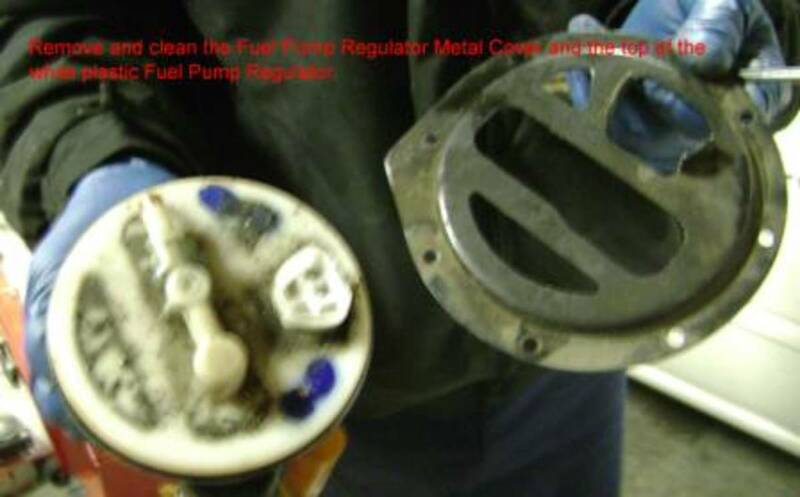 In addition, worn out rubber fuel pressure seals or the remains of a disintegrating mesh pump screen (caused by ethanol) getting sucked in the pump intake port are some other causes of failure. Like most cars, Toyota fuel pumps are electric motors situated inside the bottom of the fuel tank and is submerged in fuel. A simple plastic mesh screen (not a filter) prevents large particles from entering the pump. The design configuration for the Camry is the same for the Corolla, Avalon, ES300 and the Solara. Other Toyota cars may be the same. At 10 years of use or over 100,000 miles, fuel pump replacement is good Preventative Maintenance (PM). 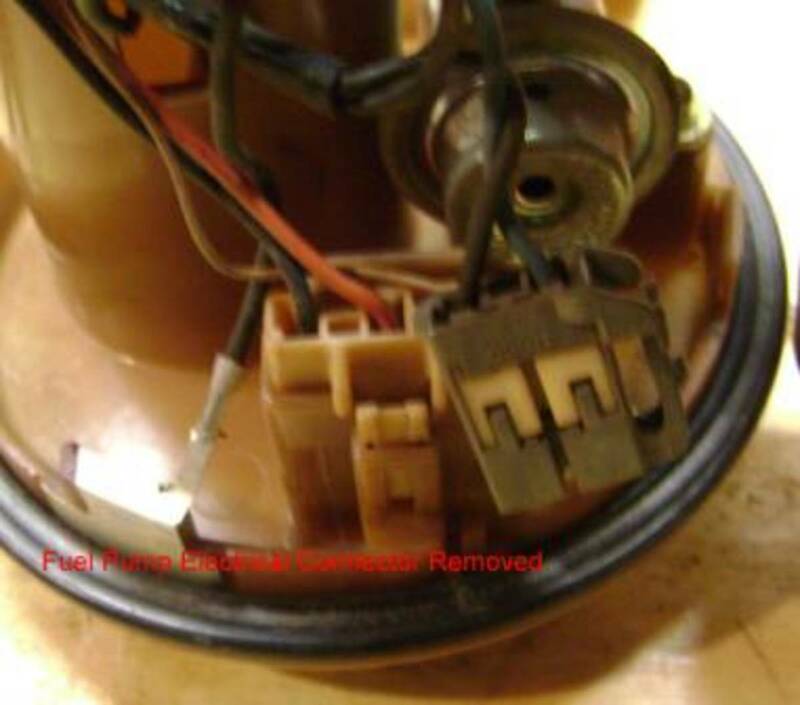 Since fuel pumps are electrical/mechanical devices, parts will wear. So what may appear to be working fine one day can fail the next week or month or year without warning. That is the risk of owning old, high mileage cars. Most repair shops charge over $400 for replacement and combined that with a tow job and fuel filter replacement, repair bills can go over $800. No special tools are required to perform a fuel pump replacement. Taking one's time, the task can be performed in approximately 1.5 hours. 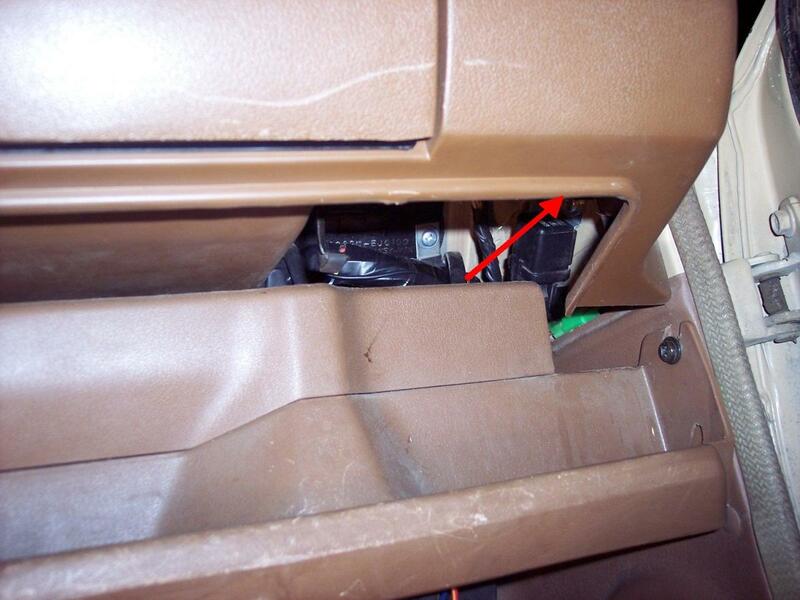 An access port/panel located under the rear passenger seat negates the need to place the car on a lift in order to drop the tank to gain access to the fuel pump regulator. Remove the key from the ignition. 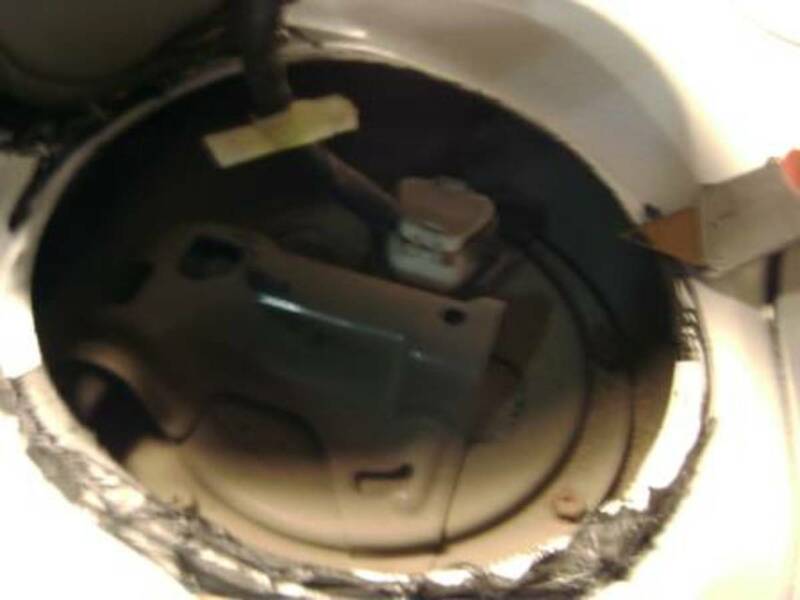 For added safety, disconnect the positive end of the battery terminal. Pull on left and right of center front portion of the seat cushion for removal. Then angle the seat cushion out pushing the seat belt connects through the cushion openings. 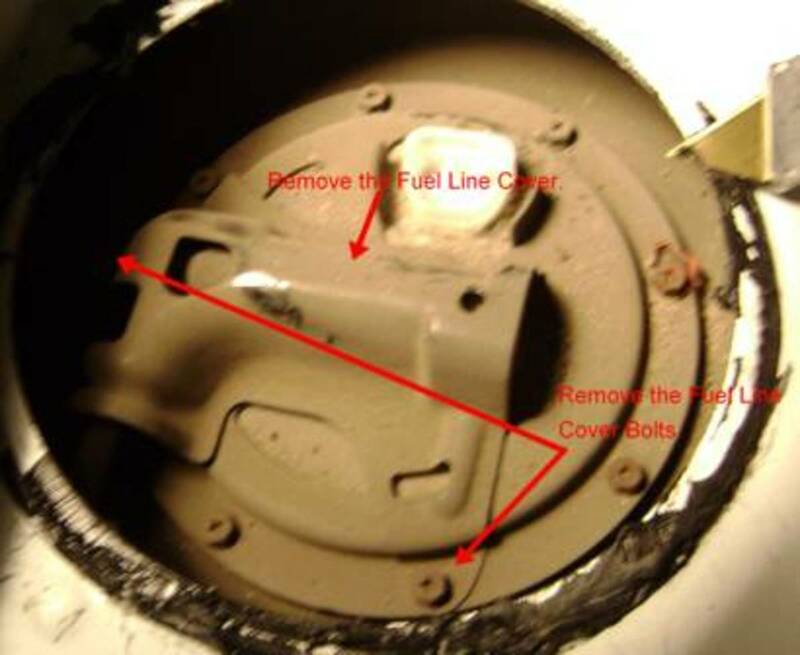 The access panel is a circular stamped sheet metal cover that is fused to the body of the car with semi-adhesive glue. The cover can be removed by gently prying around the cover ( with a large screwdriver) until a there is enough room to insert a knife to cut and separate the glue from both the cover and the body. 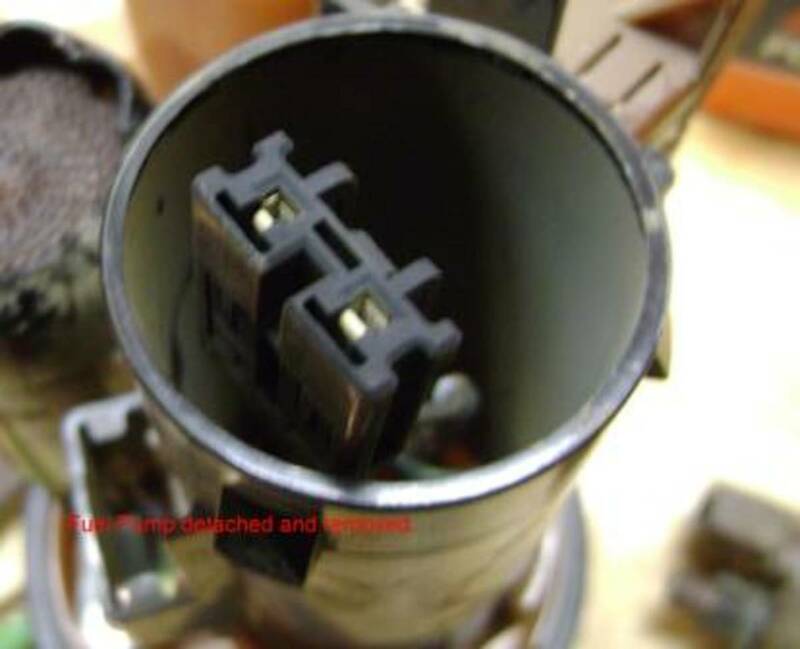 Pinch the female plug release pin and wiggle the fitting off the male connector. 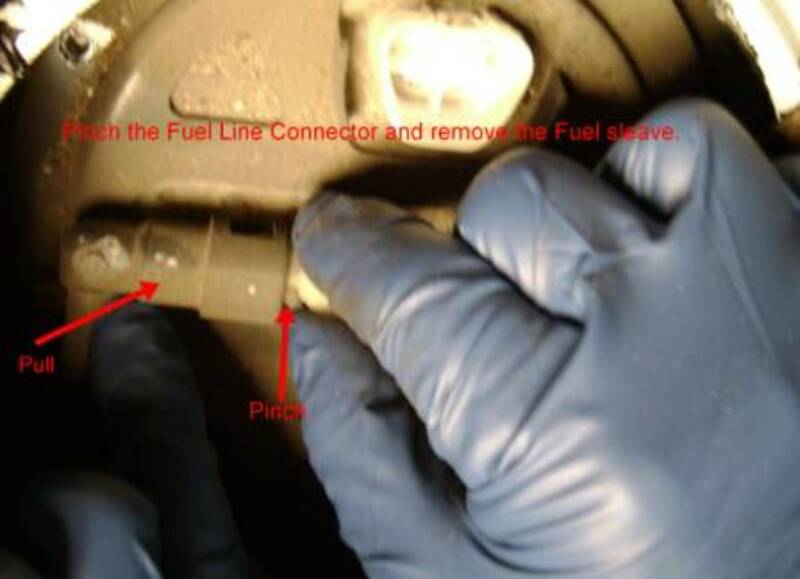 Disconnect the Fuel Line from the Regulator by pinching the white plastic fuel line sleave and gently pull on the black fuel line connector. A slight amount of fuel will spill. 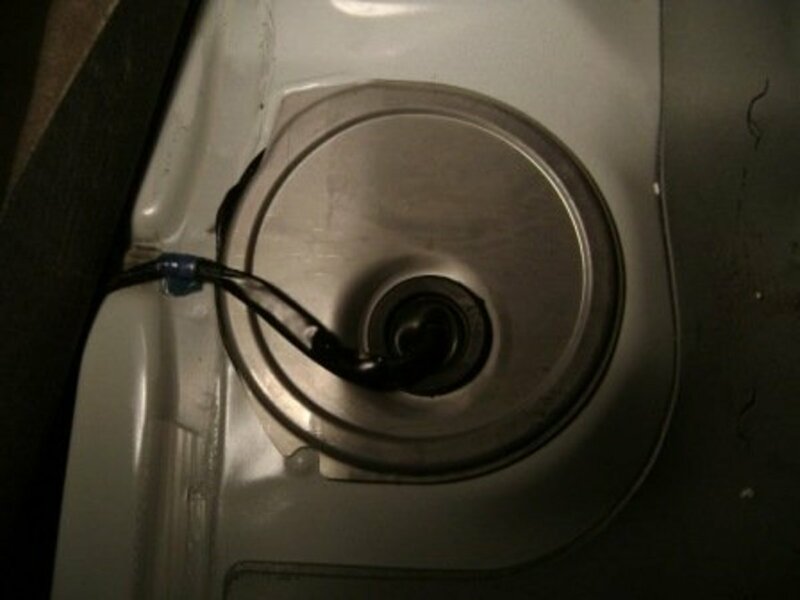 Push the disconnected fuel line behind the exterior of the tank. These bolts are 8mm and it is suggest that a 1/4 socket wrench with an extension be used to unscrew these bolts. Do not completely remove the bolt. 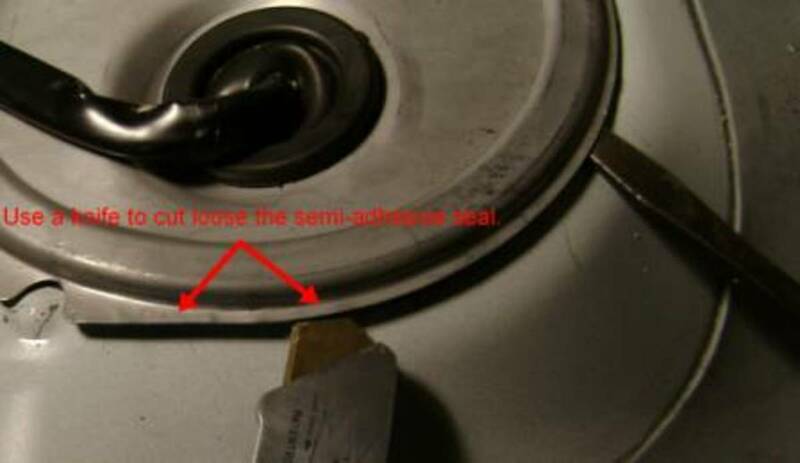 Remove the last few threads left with your fingers or run the risk of the bolts falling out under the fuel tank. Alternatively, a magnetic Phillips head screwdriver would work well. Angle the Fuel Pump Regulator out of the Tank. Position the regulator so as to not damage the Fuel Float lever. Let the fuel drain in the regulator drain into the tank. Use a towel to capture any dripping fuel when move the regulator out of the car. 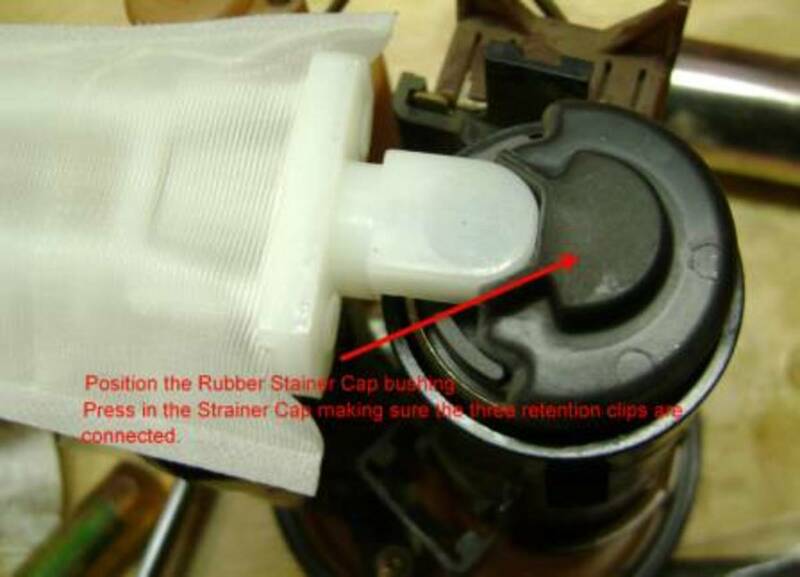 The Cap/Cover over the Fuel Pump Mesh Strainer can be removed by prying off the two of the three clips holding it in place. This can be performed by using two thin tipped screw drivers placed under each of the two clips and lifting the clips over the tabs. 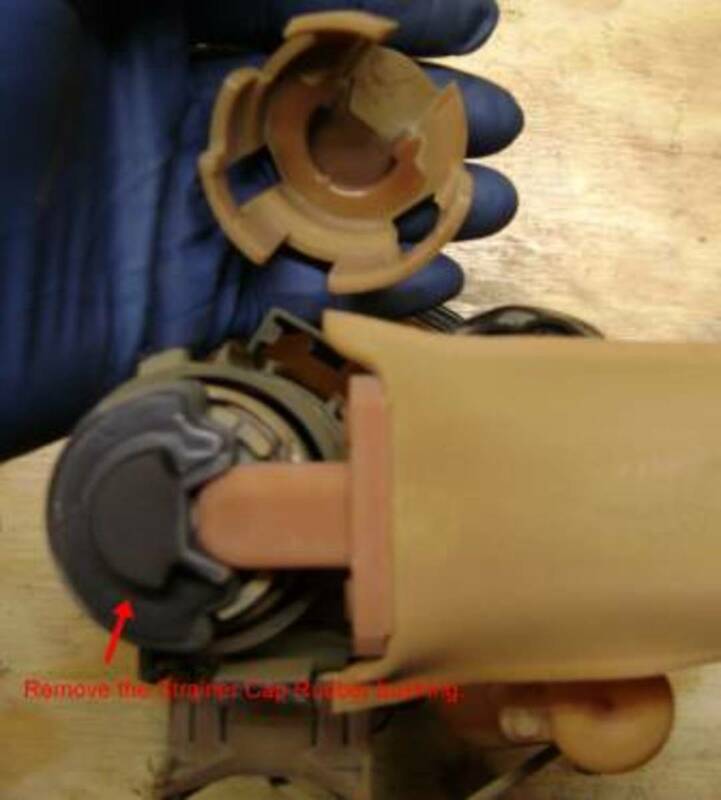 The rubber bushing can then be removed exposing the fuel pump with the mesh strainer and retention clip. the clip can be removed by gently prying off with a knife. Work the knife around the clip applying upward pressure until the clip comes off. Unplug the electrical fitting from the base of the regulator. This will allow the fuel pump to be lifted out of the regulator with the pump side wire attached. Gently wiggle and twist the Fuel Pump from the Regulator. 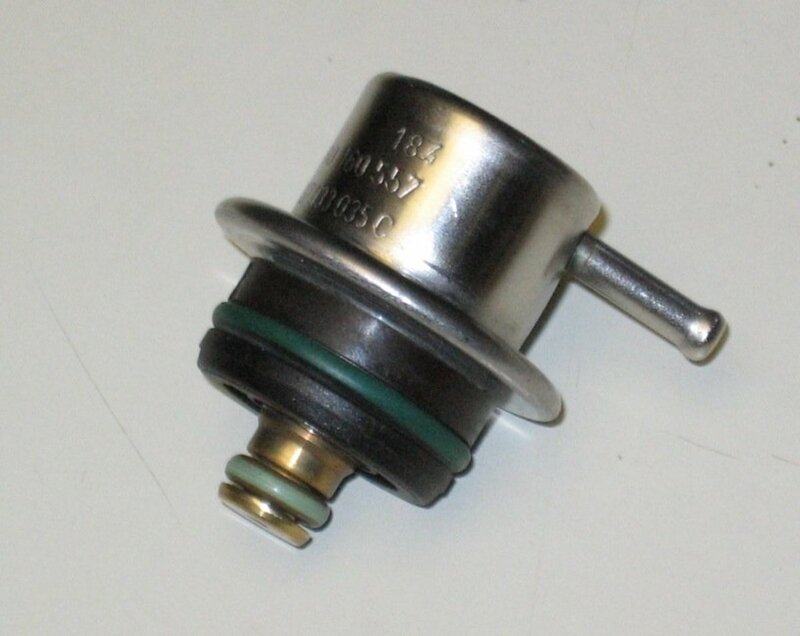 The Fuel Pump pressure output port is connected to the Regulator with a O Ring. The resistance in the O ring is what needs to be overcome. After the pump comes out, disconnect the electrically wire connector to the pump. 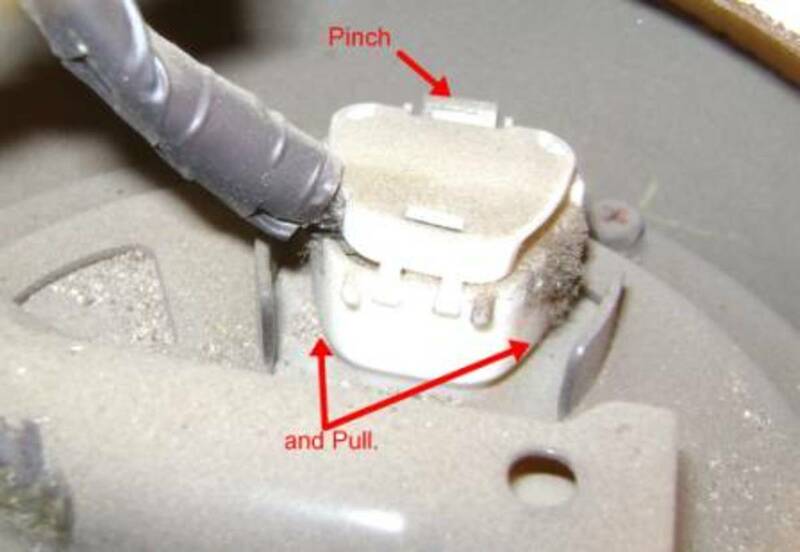 Pinch the release pin and pull/wiggle the electrical female plug off. The O ring may or may not be attached to the pressure output port of the fuel pump. If not attached, use either a small screw driver or make shift wire with a hook on the end to pull the O ring out. 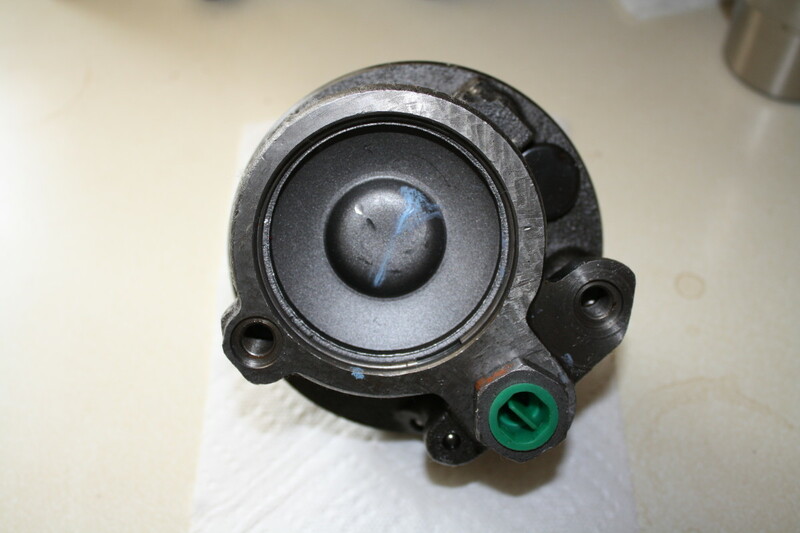 Underneath the O ring in the Regulator is a plastic cap that should also be removed. Transfer from the old fuel pump pressure output port the Cap, O Ring and Guide Clip. If your new fuel pump came with a new O ring, discard the old O ring. Apply some silicone lubricant on the O ring and female electrical fitting. Connect the electrical fitting to the new Fuel Pump. Gently push the new pump into the Regulator. Press the new Fuel Pump Mesh Screen onto the new Fuel Pump. 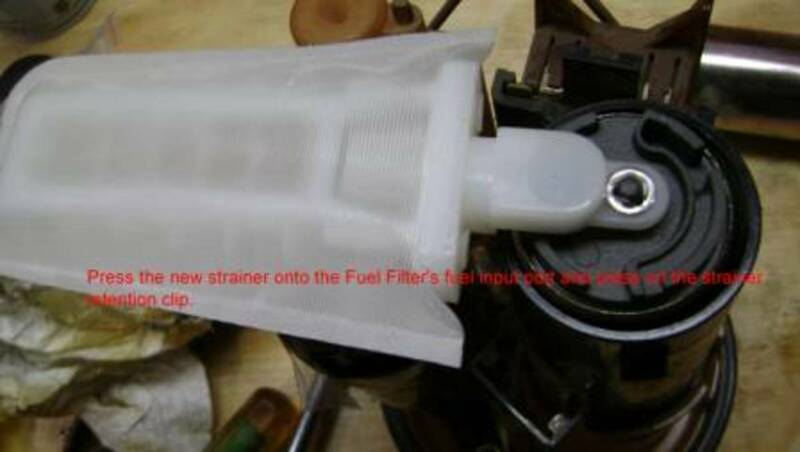 Press the new Fuel Pump Mesh Screen retention clip onto the Fuel Pump pin. Position the rubber bushing over the new fuel pump. 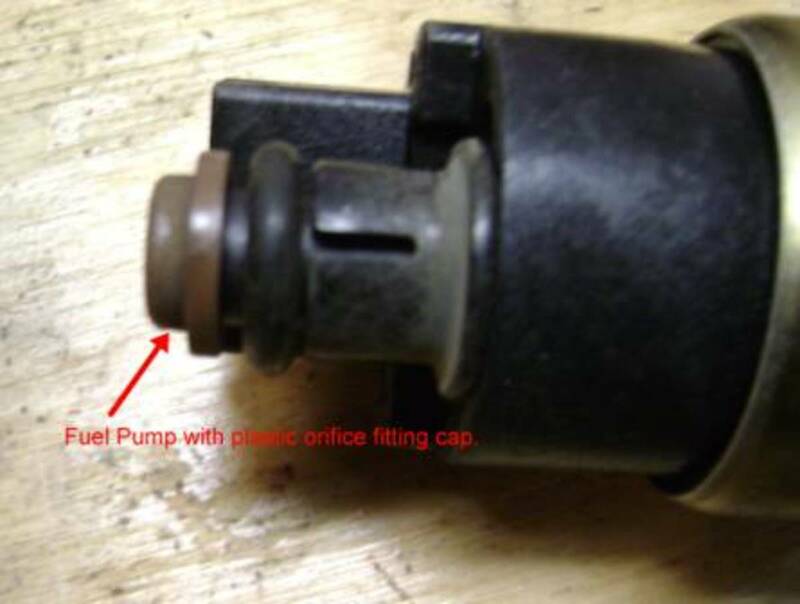 Connect the plastic Fuel Pump Cap over the Fuel Pump Bushing. 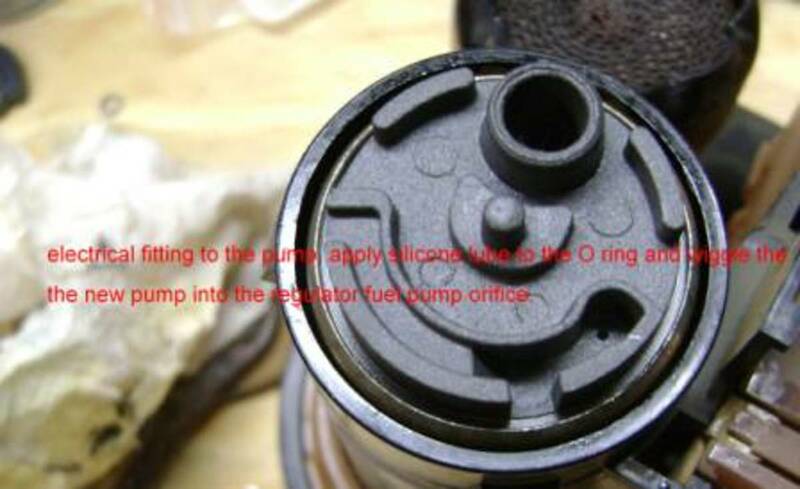 Ensure that the Clip ends are attached to the body of the Regulator Fuel Pump Housing. Reconnect the other fuel pump electrical fitting at the base of the Regulator back onto the regulator. 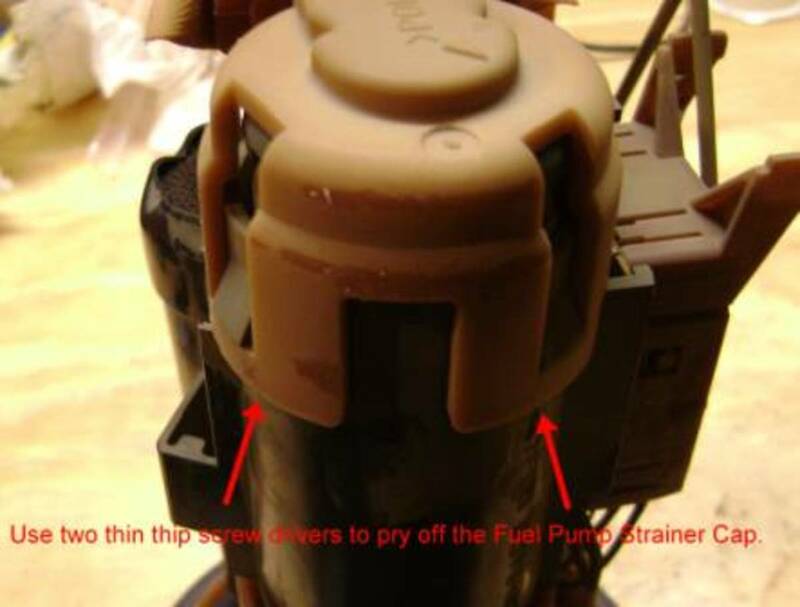 Carefully angle the Fuel Pump Regulator back into the fuel tank opening starting from the float valve. The regulator fuel Input port should be facing towards the front of the car. Position the Regulator Mounting Plate over the Regulator. Align the mounting plate with the bolt holes. Screw back in (finger tight) the 8mm bolts except the bolts for the fuel port/fitting cover. After all the bolts have been screwed in, apply the final tension/tightening on all the bolts. 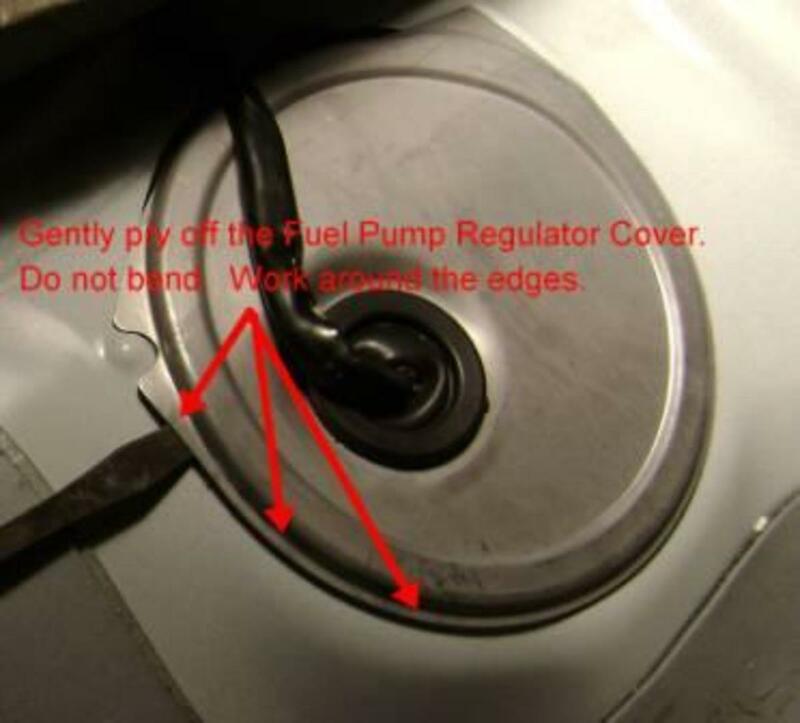 Re-connect the fuel line to the regulator. 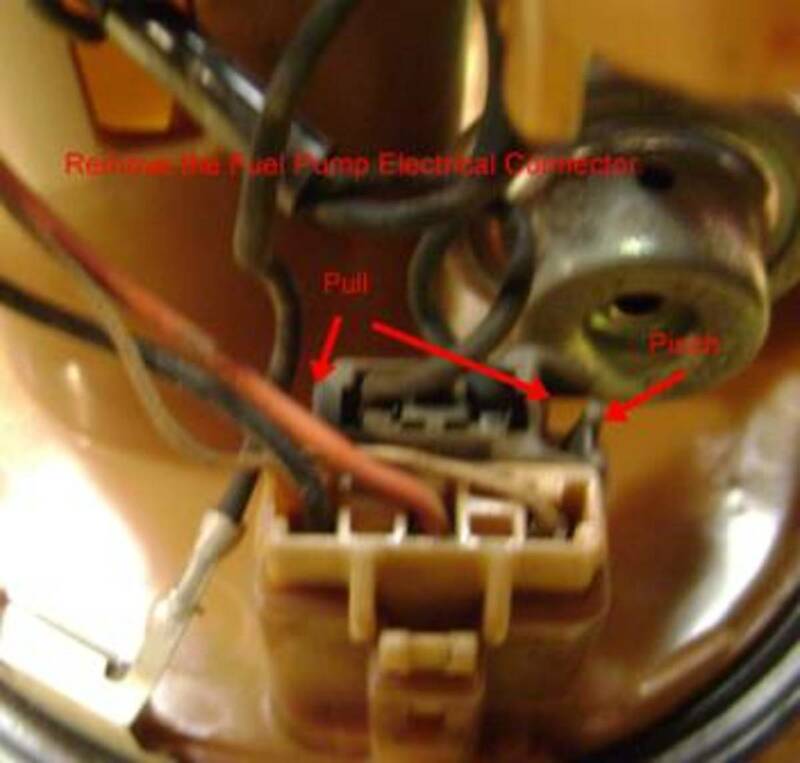 Ensure that the clips on the regulator input port are in alignment with the square openings in the fuel line connector. 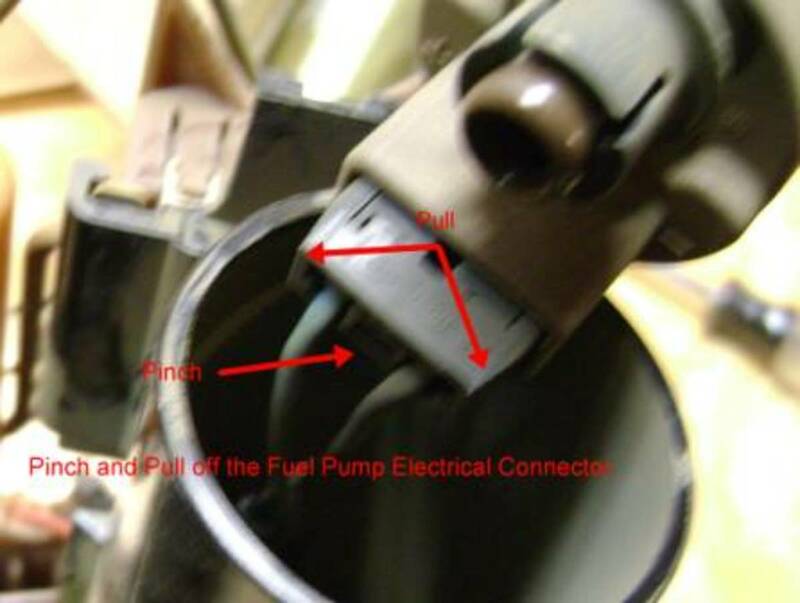 Push and pull on the fuel line connection to ensure that the connection is good. Re-attach the Fuel Port cover with the two remaining 8mm bolts. Screw in and tighten the bolts. 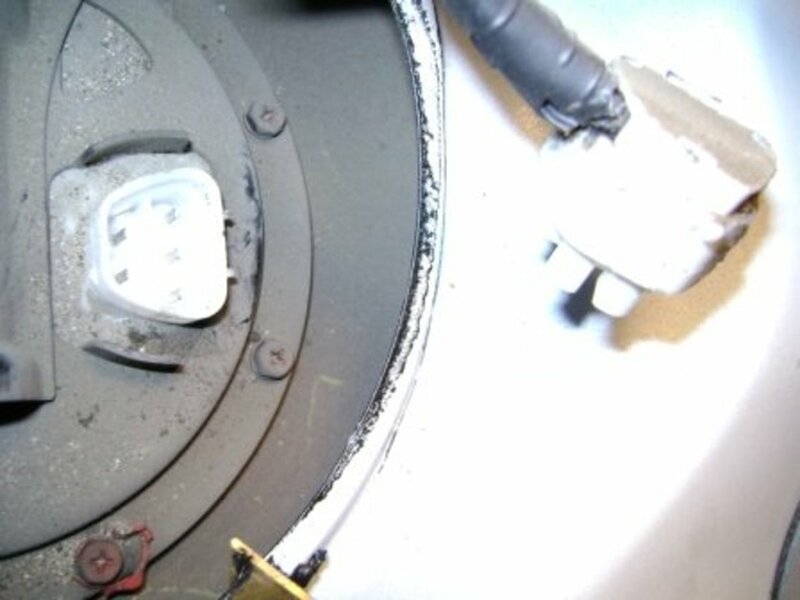 If the battery was disconnected, reattach the battery. Start the car. 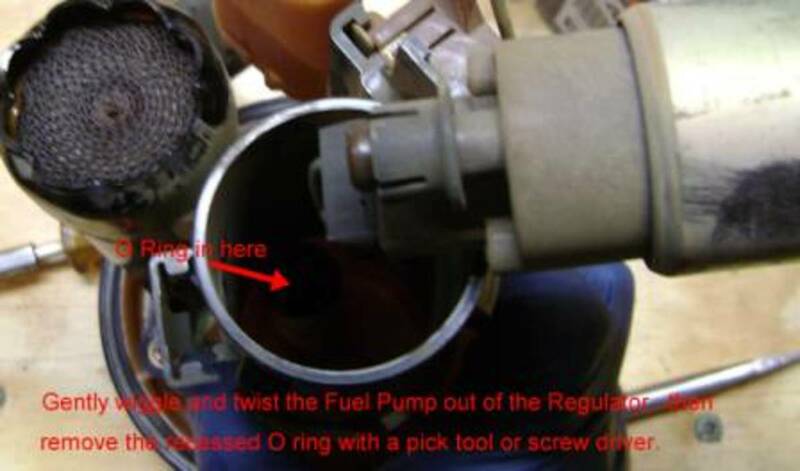 It may take a few attempts before then engine starts due to the air gap in the fuel line. 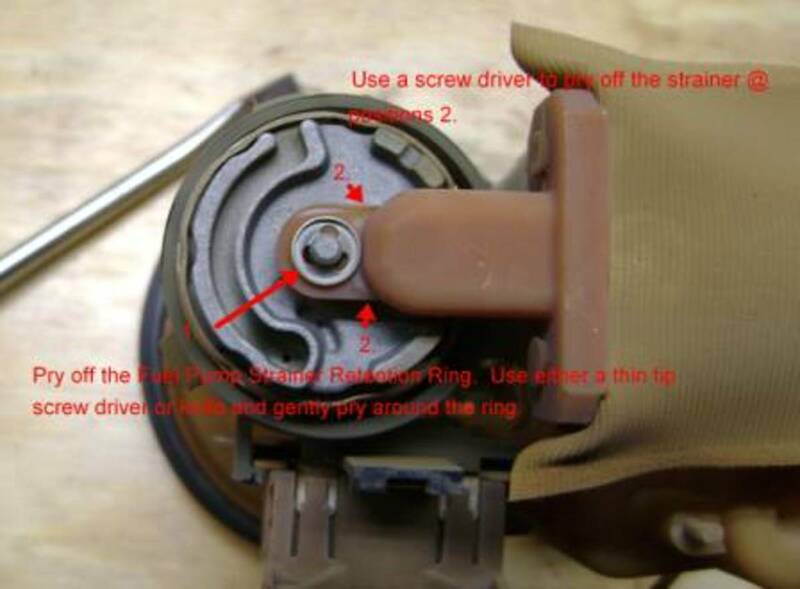 Check the fitting on the fuel pump regulator for leaks. 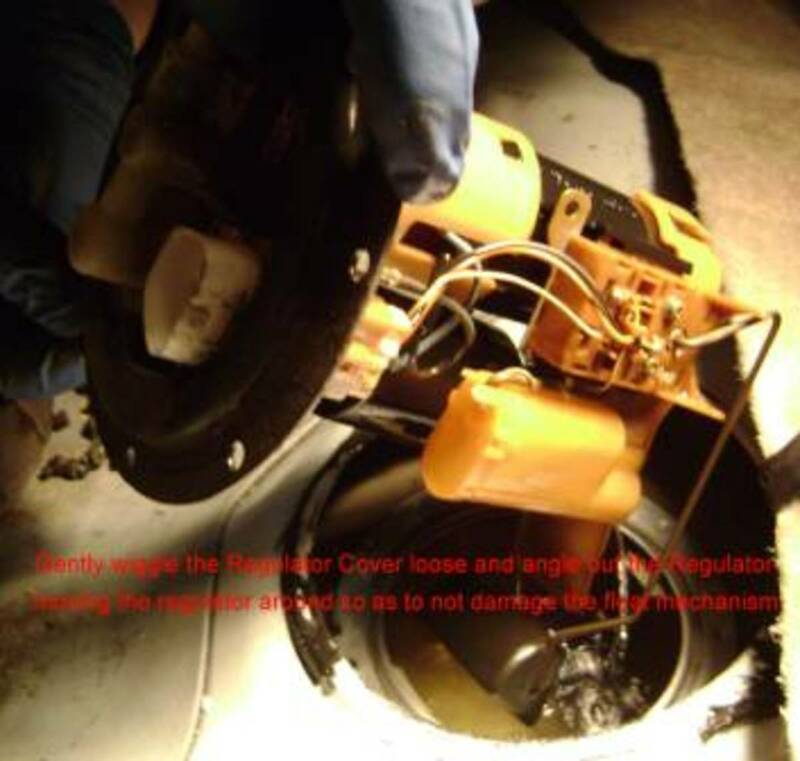 If no leaks, stop the engine and press the Fuel Pump Regulator Access Cover/Plate over the Regulator access opening. The semi-adhesive glue should be viscus enough to hold the Cover in place. A few taps with a blunt instrument around the cover should be enough. 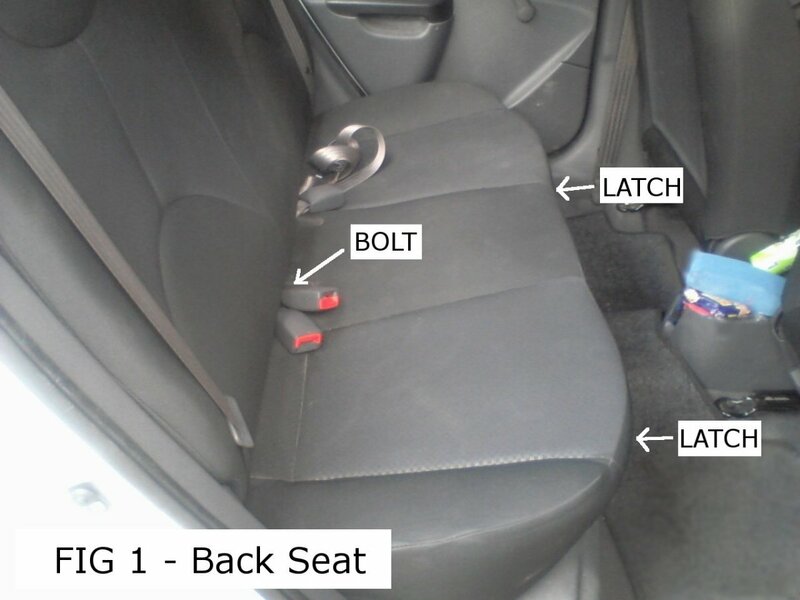 Install the seat cushion back in the car on an angle where the seat belt clips can be pulled back into the belt clip openings. 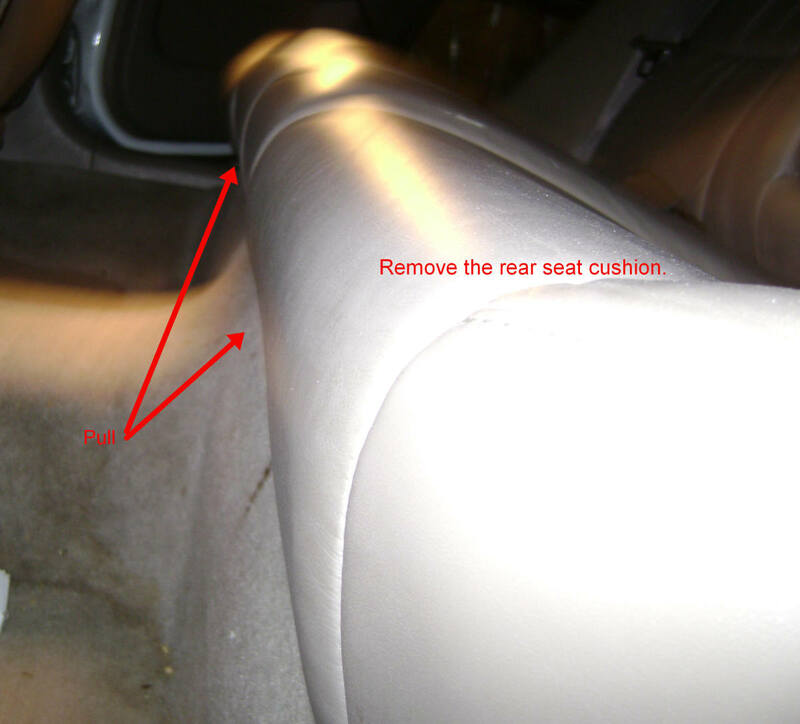 Push the seat back and align the pins in the base of the seat with the rectangular openings on the floor. Press down firmly to clip the pins into the opening. How do I check the fuel pressure on a 2000 Avalon? 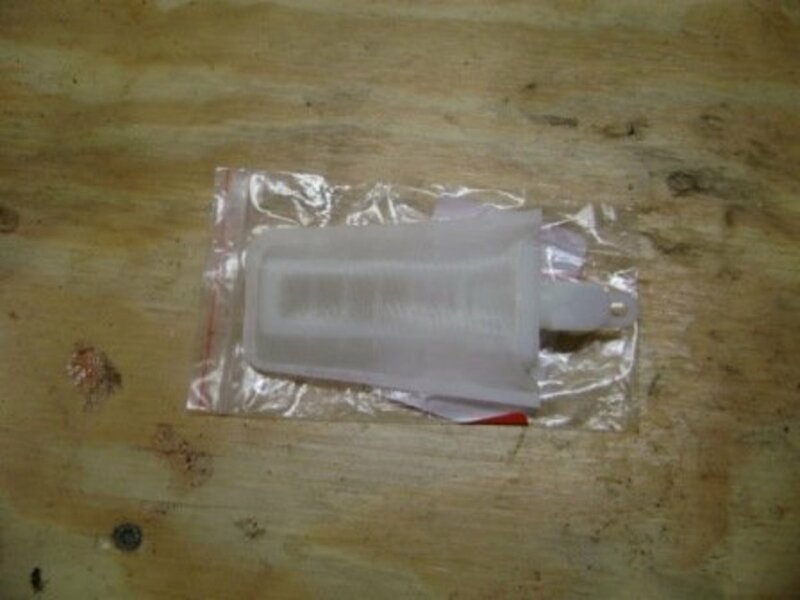 You'll have to purchase a fuel pressure test kit and get the adapters to tie into your fuel line. 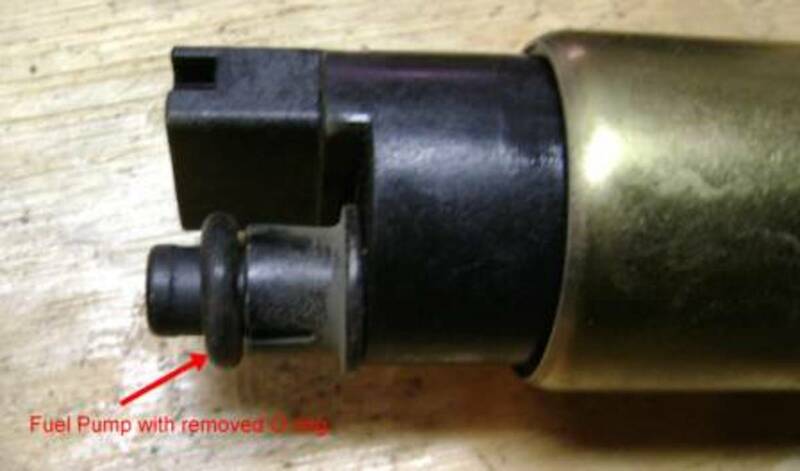 From the fuel filter to the fuel injector rail is a male to female coupler. You can go to the junkyard and hacksaw off the couplers to make your adapter. Also, your fuel pressure should be somewhere around 50 psi. Does this procedure apply for a 2000 Toyota Avalon too? Yes. The procedure is pretty much the same; however, there may be a slight difference in the fuel pump housing design. 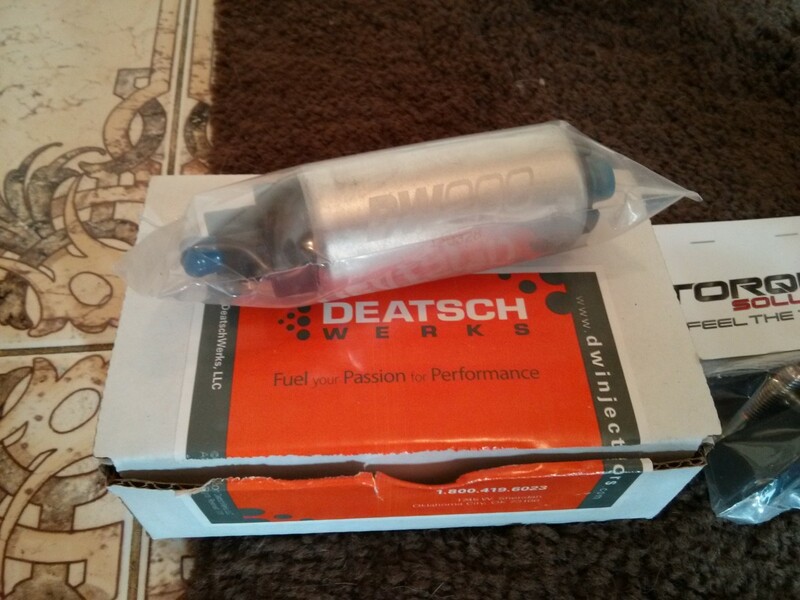 The pumps are made by Denso and Toyota uses just about the same pump for all their cars. You can't test the pressure levels via a battery connection. Very helpful for me in troubleshooting my Avalon 2000.just enjoying the DIY concepts. But I guess we can test the strength of the pump through simple battery connection.